As usual, we had a bunch of overripe pears in the house, so there was no problem finding the fundamental ingredients. 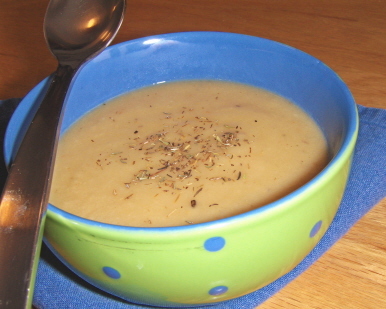 After a bit of digging around for some kind of turnip and pear soup recipe, I found something that sounded appealing in my old Sundays at the Moosewood cookbook, called, oddly enough, Turnip and Pear Soup. The challenge began! In a large saucepan, saute the onion in the oil for about 5 minutes, until translucent but not browned (I ended up browning it a bit, and it didn’t seem to make a difference). Add the chopped root vegetables and fruit (if used) along with the salt and herbs. Saute for another 10 minutes or so, stirring occasionally. Add the vegetable stock and cook, covered, on low heat for 20 to 30 minutes, until the vegetables are soft and tender. Add the spices. In a blender or food processor, puree the soup with juice or milk, until smooth and thick. Season with black pepper to taste. Garnish with fresh or more dried thyme, if desired. Makes 4 cups. Suitable for: ACD Maintenance; refined sugar-free, gluten-free, grain-free, dairy-free, egg free, soy-free, nut-free, yeast-free, vegan.